The classroom is full of noise, sound, movement and increasing mastery of complex moving patterns, patterns which are created, observed, refined, and analyzed throughout the one-hour workshop. 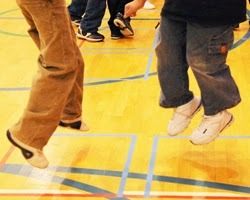 Having created four-beat Pattern A on Day 2, kids are charged with creating a second dance pattern. Pattern B needs to be as different as possible from Pattern A. This means returning to the Movement Variables chart as a resource. Are all your movements in Pattern A jumps and slides? Pattern B should have some other kinds of movements -- steps, turns, touches. Is your Pattern A full of turns? Try to create something new that feels and looks interesting without any turns. How about starting and ending position? If you start and/or end in the center of your square in Pattern A, how about changing that in your second pattern? You get the picture, yes? What's very clear is that I generally always see much more interesting, creative work in Pattern B, in both kid and teacher workshops. What is also clear is that giving children agency over an inventory of pattern variables is highly empowering and every class this week has been super focused, productive and engaged. And, yes, those are simple combinations. But only on paper. The challenge is to see where the first pattern in the sequence ends within your dance space and how to execute your second pattern from wherever you ended your first pattern. Meaning, you can't go back to the starting position of the second pattern (position 0) even if you're in a tricky position or facing a new direction. These transitions are where the really interesting spatial/math thinking and problem solving occur. Note #3: Biggest challenge in Day 3? Says one 4th grader: "When I started combining Pattern A and Pattern B they were separate in my brain. It took a lot of time and effort to make them into AB." Me: "You mean it took a while before it felt like they were the new 8-count pattern, Pattern C?" Isn't learning math and dance at the same time fun? Yup.